Product prices and availability are accurate as of 2019-04-20 14:26:13 UTC and are subject to change. Any price and availability information displayed on http://www.amazon.com/ at the time of purchase will apply to the purchase of this product. 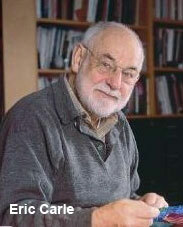 Eric Carle is the creator, author, and illustrator of The Very Hungry Caterpillar and many other children’s books. 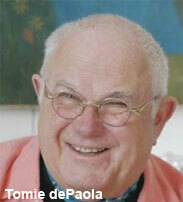 Tomie dePaola is the author and illustrator of Strega Nona: Her Story and countless other books. They recently had a conversation about their careers as picture book authors. Tomie dePaola: When I was only four years old, I announced to my family in particular and to the world in general that I was going to become an artist, and write stories and draw pictures for books. I never swayed from that early declaration. I’ve always been curious to know, what inspired you to become a creator and illustrator of picture books? 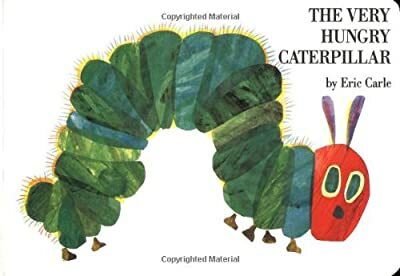 Eric Carle: My career began as a graphic designer and for a number of years I worked as an art director for an advertising agency in New York. In the mid 1960's Bill Martin, Jr. saw an ad of a red lobster that I had designed and asked me to illustrate his Brown Bear, Brown Bear, What Do You See? Well, I was set on fire! I was so inspired by this book, and the opportunity to illustrate it changed my life. After that, I started to create my own books, both words and pictures, and really it was then that I had found my true course in life. Now, I have a question for you, Tomie. How would you describe your artistic style, and has it changed over time? Tomie dePaola: My illustration style is heavily influenced by folk art--strong simple shapes, bold lines, color, color, color and a deceptive simplicity. My style began to develop early in art school, and through the years, it hasn’t changed very much, but it has refined itself. How would you describe yours? 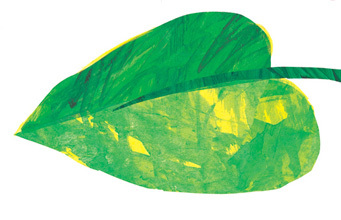 Eric Carle: My aim with my work is to simplify and refine, be logical and harmonious. I like to use simple shapes, bright colors and a lot of white space. I write for the child inside of me. That is always where I begin. 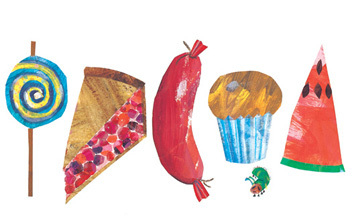 Eric Carle: I often tell people about the four magic letters: DO IT. I want to be encouraging but I can only offer the example of my own experience, which is just one approach. There are many wonderful artists to learn about, which is important. But you must use your own imagination. You have to just do it. Tomie dePaola: How do you feel knowing that a copy of The Very Hungry Caterpillar is sold every 30 seconds, somewhere in the world? 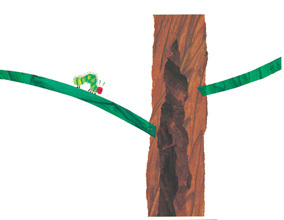 Eric Carle: It is hard for me, maybe for others too, to grasp this concept. But I am truly honored that my story is enjoyed by so many and that it is now being shared by a generation of parents who grew up with my book. How about your Strega Nona. She is one of your most popular characters. Can you share how she came to be? Tomie dePaola: In the ‘70s when I was teaching at a college, we were required to attend faculty meetings. I always sat in the back with a yellow legal pad. Everyone thought I was taking notes. At one meeting a doodle appeared of a little lady with a big nose and a big chin. I named her Strega Nona, and the rest is history. 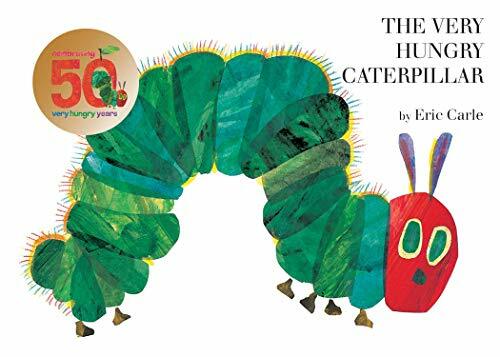 Speaking of history, how will you be celebrating the third annual Very Hungry Caterpillar Day this year? 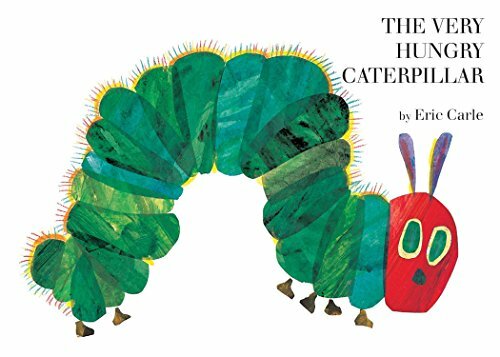 Eric Carle: On The Very Hungry Caterpillar Day, March 20th, I will probably be at home with my wife, Bobbie (I am a bit of a hermit, actually). 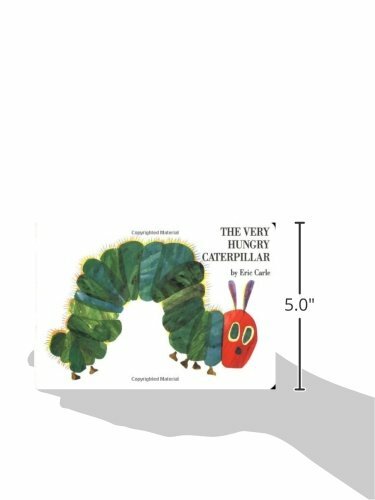 But I will be saying a little toast to the caterpillar for whom I have a special place in my heart. And speaking of holidays, isn’t your favorite holiday Christmas. Do you have a special Christmas memory? Tomie dePaola: Christmas is my favorite holiday. My favorite Christmas was the one when I received tons and tons of art supplies: everything from an easel to paints, pads and pads of paper, and “how to draw” books.